Periodontal disease causes your gums to recede, creating pockets in which bacteria can grow. It weakens the attachments that hold your teeth in place, making them move if you press on them and when you chew. The bacteria that cause periodontal disease differ from those that typically appear in the human mouth. The presence of these bacteria can affect your general health, as well as causing dental pain, gum infections, and lost teeth. Periodontal therapies, including scaling and root planing, remove unhealthful deposits from below your gums. To prevent these deposits from forming again, patients with periodontal disease need regular periodontal maintenance treatments. As part of a healthful dental-care regime, dentists assess and clean their patients’ teeth at least every six months, checking for cavities and removing any tartar that formed where plaque accumulated. These cleanings, called prophylactic care, remain essential for everyone. They do a great job of screening for decay and maintaining dental health above the gum line. Patients who have been diagnosed with periodontal disease need additional treatments to address the health of their teeth under the gums. Unlike most other dental problems, periodontal disease can’t be cured, but it can be controlled. Following professional recommendations for home care and maintaining a regular schedule of professional cleanings helps keep periodontal disease from advancing. But even the best flossing and brushing techniques can’t address all the problems that the disease can cause. Therapeutically, periodontal maintenance removes the bacteria that form a biofilm under the gums and cause periodontal disease. These bacterial colonies grow back within three months. As a result, periodontal maintenance treatment routines run on a three-month schedule, helping the immune system attack the bacteria. If the bacteria aren’t removed, the immune system may be unable to keep them in check, and periodontal disease begins weakening the attachments that hold the teeth in place. Periodontal maintenance may seem similar to a regular dental cleaning. Overall, periodontal maintenance checks for signs that the mouth is getting healthier, staying the same as it was at the last visit, or showing progressive loss of gum tissue and dental bone. The treatment includes cleaning the teeth above and below the gum line, measuring pockets in the gums and verifying whether any of them have grown deeper, and taking x-rays to assess the condition of the teeth and bone structure. 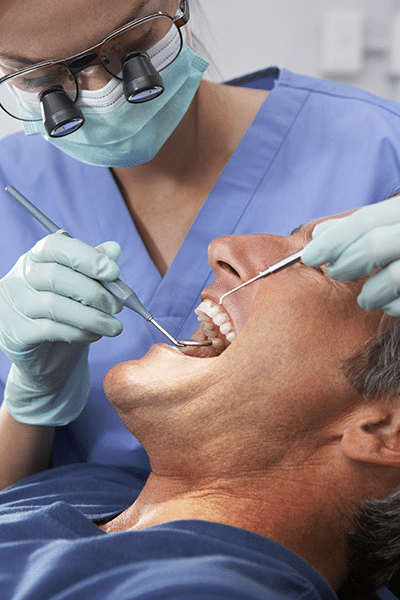 Dental insurance may not cover the costs of periodontal maintenance on a three-month schedule. Patients who consider skipping treatments that their insurance won’t cover should ask themselves this question: If you were prescribed a medication that you had to take four times a day, but your insurance only covered two daily doses, would the medicine work just as well without the other two doses? The answer’s obviously “No”—and the same answer applies to periodontal maintenance. Periodontal maintenance helps patients preserve their oral health and avoid the need for surgery to correct serious problems. Patients whose periodontal disease stabilizes may be able to increase the interval between their maintenance treatments as their immune systems become better at fending off the bacteria that attack the mouth.